Here is a joke that I am sure many joke lovers have come across before already but I have a friend who asked me why it has been such a long time that I haven't updated my "Daily" joke blog. So this one's for him! A panda walks into a bar, sits down and orders a sandwich. He eats, pulls out a gun and shoots the waiter dead. As the panda stands up to go, the bartender shouts, "Hey! Where are you going? You just shot my waiter and you didn't pay for the food." The panda yells back, "Hey, man, I'm a panda. Look it up!" 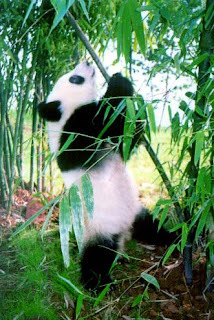 The bartender opens his dictionary to panda: "A tree-climbing mammal of Asian origin, characterized by distinct black and white coloring. Eats shoots and leaves."